One man, who has spent the last 25 years helping conduct this symphony of services, thinks that much of the difficulty can be alleviated by moving both the dispersal of aid and the internal operations of the UN itself to a blockchain. For the past four months, the newly appointed special advisor for UN engagement and blockchain technology at the UN’s Office for Project Services (UNOPS), Yoshiyuki Yamamoto, has been meeting informally with members of other agencies to imagine what the organization would look like if it was truly united on a blockchain. Yamamoto’s own exposure to bitcoin goes back to 2011 when it was little more than a passing interest. But, it wasn’t until last year that he “by chance” read Satoshi Nakamoto’s white paper that he started to see how an immutable, shared ledger might help align the agencies within the UN. To demonstrate the inefficiencies of the current system, Yamamoto, the former director of the UNOPS Peace and Security Cluster, told the story of when a hospital in Kabul was so desperate for a generator that it applied to multiple UN agencies for help, only to finally receive five generators. In another story demonstrating how difficulties proving identity have resulted in aid being diverted from its intended recipients, Yamamoto related how ID cards that entitle their owners to UN supplies have been collected by tribal leaders and traded as currency. Exactly how much is lost to such waste is hard to say, he said, but this lack of transparency is one reason he now advocates for blockchain. The problem is so pervasive that, in 2012, the 8th secretary-general of the UN, Ban Ki-moon, stated that corruption in the previous year had prevented 30% of all development assistance from reaching its final destination. To give some idea as to how much this loss might be, that same year, $12.2bn in net disbursements were granted by the UN, according to the Global Policy Forum, a policy watchdog that monitors the work of the agency. If blockchain can be implemented successfully, Yamamoto believes increased transparency could result in fewer internal disputes and more efficient allocation of resources. As a result, he argued, this might increase the willingness of donors to give money, including individual donors, a largely untapped resource at the moment. With new donation options that might one day also include cryptocurrency itself, the end result could be more funds to help those in need. Progress towards this vision is slow, but steady. After discovering unrelated blockchain efforts being conducted within the World Food Program (WFP), the United Nations Children’s Fund (Unicef) and UN Women, Yamamoto reached out to get a better understanding of those groups’ work. Yamamoto and these other early supporters established an informal blockchain group shortly after. Over the following months, Yamamoto said he and other UN representatives frequented multiple Bitcoin NYC Meetups, asking about the potential benefits of the technology to the UN. Word spread, Yamamoto said, and individual representatives from other UN organizations also expressed interest in getting involved. They agreed to meet in person approximately every other week, when an invited guest from outside the UN would discuss what it might mean if their agencies worked together on a joint blockchain initiative. Speakers at these events have included the former CEO of ID2020 and advisor to One World Identity, Susan Joseph, and Dickson Nsofor of blockchain startup Humaniq, which last week raised $5m in an initial coin offering (ICO). Last month, in a published joint request for information (RFI), Yamamoto announced the informal group had grown to seven UN organizations – also including the UN High Commissioner for Refugees (UNHCR) and the UN Development Group (UNDG). The RFI set out “to identify potential partners/suppliers for the future work in the area of international humanitarian, development or peacekeeping assistance”. A week after the RFI was published, the World Bank and the Inter-American Development Bank announced they would be organizing the information in a way that caters to “the needs of the multinational development and humanitarian community”. The request deadline was also extended to 4th June. One of the early supporters of the inter-agency blockchain initiative, WFP financial officer Houman Haddad, described the cooperation between initiatives in an interview with CoinDesk, saying that developing the technology collaboratively could help “harmonize” humanitarian global aid. “We are in discussions with everyone we can be in a discussion with,” said Haddad, adding that the aim is to involve those parties in the “design and development” of the project, rather than just build a system and later tell them “use it”. Since the informal group of UN agencies first met, blockchain activity in the organization has grown. But, as the participants make clear, the meetings are still very informal, with independent work still largely driving the progress. In March, UN Women partnered with Innovation Norway; in April, the WFP revealed its first large-scale ethereum project; and, earlier this month, the UN Centre for Trade Facilitation and Electronic Business (Cefact) proposed writing a pair of white papers focused on technical and business implications of blockchain. Most recently, the group of UN agencies exploring blockchain had its regular meeting on Thursday, 4th May, including invited guest speakers from Microsoft, ConsenSys and the Estonian government’s e-Governance Academy. 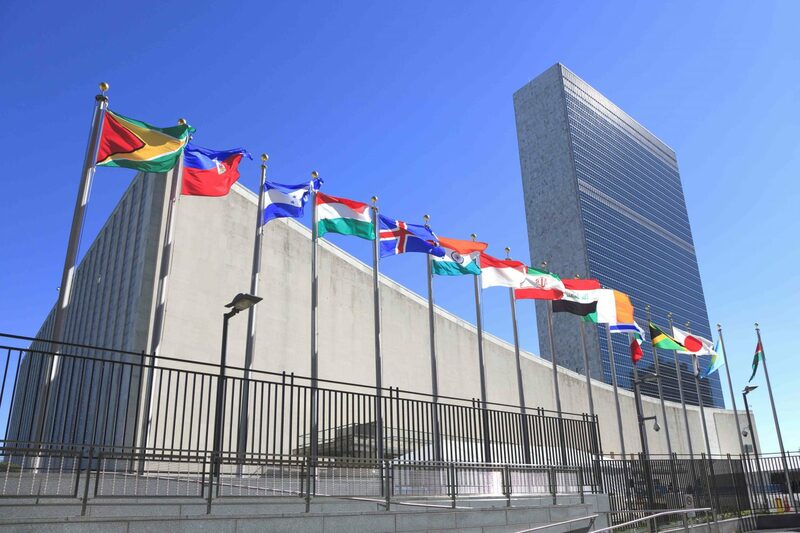 Though the event was closed to the media, Yamamoto told CoinDesk afterwards that approximately 10 representatives of the UN were present, including for the first time two from the UN Secretariat. The group is currently at the earliest stages of exploring multiple blockchain consortia models, including the Enterprise Ethereum Alliance and Hyperledger. Concerned about committing to a specific blockchain too early, Yamamoto said participants are keeping an open mind. “All options are on the table at the moment,” he said. While increased transparency from blockchain might one day lure new donors, the immediate future calls for preserving the donations that already exist. In spite of a strong record of spending donations on actual aid, US President Donald Trump was elected in part thanks to a series of promises to defund the UN. And he’s stayed true to that campaign promise, saying last month that looking at the UN budget, costs are “out of control” and no one country should take on a “disproportionate share of the burden militarily or financially”. With 28.57% of the UN’s $7.87bn peacekeeping budget this year coming from the US alone, losing financial support could result in the closure of long-term projects. Going forward, Yamamoto believes moving more of that money to a blockchain could have the potential to, not only cut back on waste, but also make it easier to prove to taxpayers back home exactly what was accomplished with the money.